I read chapter one tonight of the life-changing magic of tidying up. I've owned this book for about 2 months now, but haven't gotten around to reading it yet... (I'm working on becoming more disciplined). 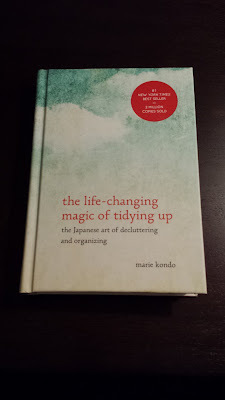 I became aware of this book from reading r/declutter and r/minimalism, both which are subreddits from a website called reddit. I read the introduction and first chapter of the book, and I'm enjoying it so far. I'm not going to talk too much about what the book covers, but will eventually post pictures of how my apartment changes from reading this book. Knowing how to tidy up will be important once I finish my transition from completely moving out of my house into my apartment. Moving items from my house that has probably 3x the square feet compared to my apartment will be interesting. I think the biggest issues of bringing stuff from my house to my apartment will come from clothing, books, and movies/dvds. I will also be keeping in mind how to minimize my smartphone usage by reading this book. I don't believe this book will talk about smartphones very much, if at all. I am not done minimizing distractions/apps on my smartphone, and I will continue analyzing my smartphone until I can feel confident I won't be a smartphone zombie. I won't post about each chapter I read, but I will probably make a post once I've finished the book.